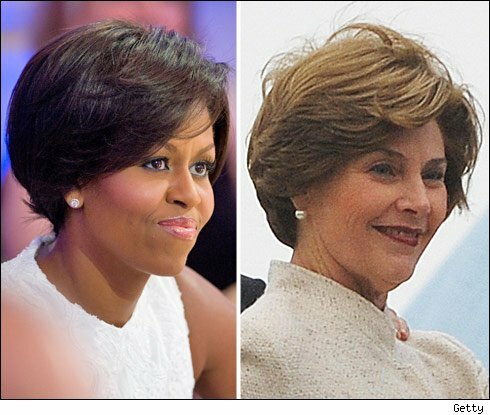 Michelle Obama, Laura Bush, at 9/11 event in Pa.
VINEYARD HAVEN, Mass. – Michelle Obama will join former first lady Laura Bush in ceremonies marking the ninth anniversary of the United Flight 93 crash in Pennsylvania during the Sept. 11 attacks. Mrs. Bush had previously confirmed her participation, saying we "must never forget the brave sacrifice of these extraordinary men and women." Passengers aboard the flight are believed to have struggled with its hijackers before the jet crashed in a field near Shanksville, Pa., killing all aboard. Mrs. Obama's press office confirmed her role as the first lady vacationed with her family on Martha's Vineyard. "Their show of support honors the lives and memories of these 40 heroes and everyone we lost on September 11th," said Neil Mulholland, head of the National Park Foundation. The group is helping build a memorial at the Shanksville site.